Have you heard of SKN-RG ? if you are a lover of Pure Organic skincare then you probably have. This is my first discovery of this brand and I can honestly say I am seriously excited to do this review, It has been a while in coming as I wanted to give all the products a really good try to be able to do them Justice. Lets start with the packaging, on first unwrapping the orange tissue paper you are presented with beautiful clean looking glass and chrome . 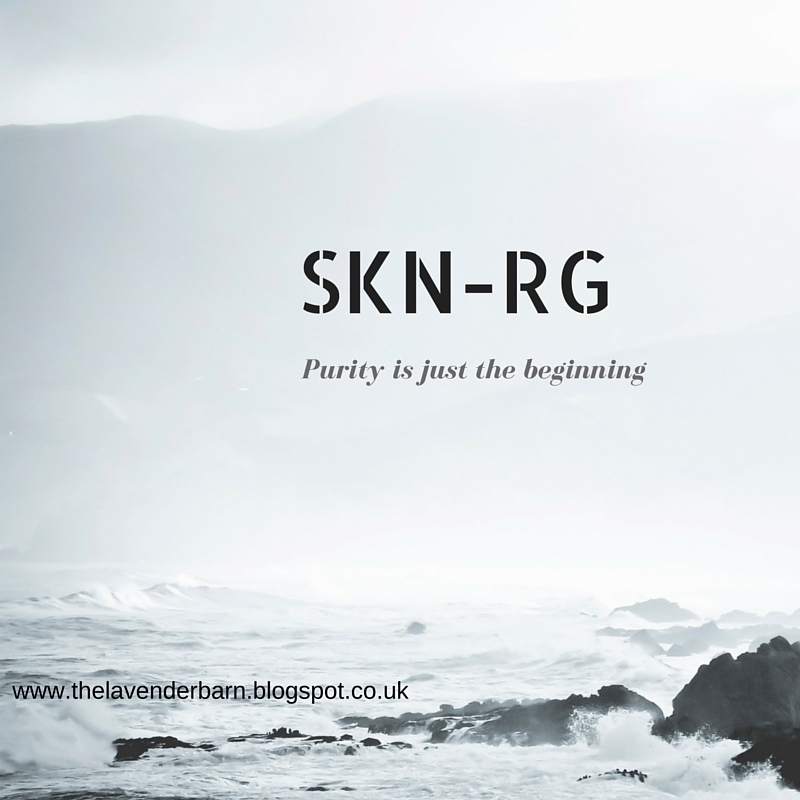 SKN-RG is the Baby of Deborah and Robert Scott, and has blossomed from years of research and testing, the Company tag line " Purity is just the beginning" is not just a gimmicky PR line, Purity really is the Company passion, even down to any water that is used in the products, it is water that has filtered through ancient Willow forests, Willow is known for its anti-inflamatory qualities, and is known for it's "asprin" qualities. This really is a salon spa brand, but do sell to the general public. So confident are Deborah & Robert that they will provide you with samples on request to allow you to try before you buy. I tested The Organics range. Starting with the Super Rich Creme Cleanser. The Pump action bottle provides just the the right amount for you to control how much you need to use, I used two pumps, and it really did do a fabulous job of cleansing, it felt comfortable to use and melted the day's grime away with ease. Followed by the Cellular Balance toner, I was left feeling really fresh and clean but with no tightness. Next was Organic Pro Serum concentrate, which a beautiful serum that sinks in and will not leave you greasy, it just gives you the perfect base for moisturiser. I then applied the Cellular repair moisturiser again in a pump, and really was good to go, the fragrance is simply divine, it is a clean natural smell which really has relaxing properties, makes you want to deep breathe and smile ! After this three step treatment you are left feeling clean, relaxed with super smooth, glowing skin. Super Rich Exfoliant Treatment, which a beautiful creamy mousse like texture, that is the most gentle exfoliant I have ever used, gorgeous, and again the smell......you really see the difference on using this product, your skin is warmed and glowing and you know it it super clean with all nasty dead cells removed. This is recommended as a weekly skin treat. Another weekly treat is the Super Rich Collagen Boosting Mask, now this is luxury at its best, apply this mask, trust me you don't need a lot of this moisturising miracle, it melts onto the skin and allows you to really chill out while you breathe in that beautiful fragrance again. leave for 8-10 mins and remove with warm water. 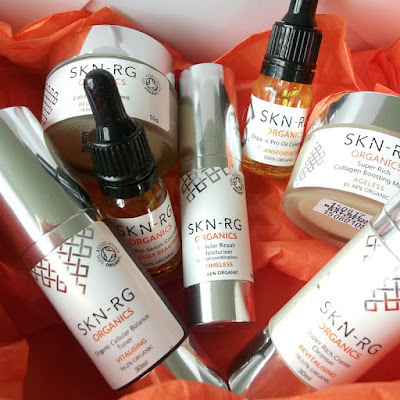 I could go on for hours singing the praises of SKN-RG but I urge you to take the time to visit their website and discover for yourself what I believe to be a total skin care package. 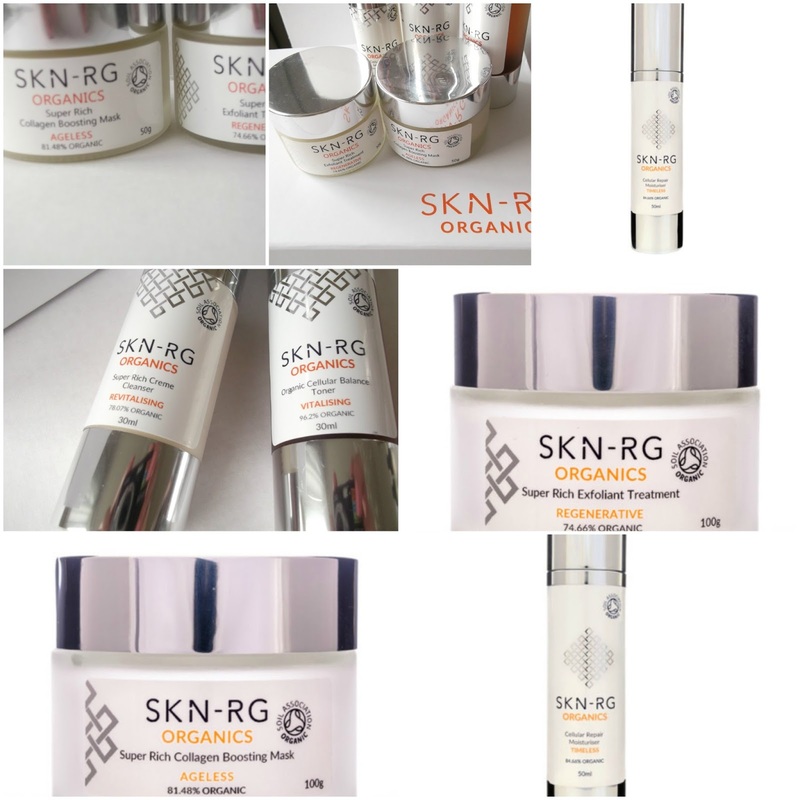 As you would expect all the products are cruelty free, Organic certified, the products are so pure and concentrated you only need the smallest amounts, so this really is affordable Luxury.